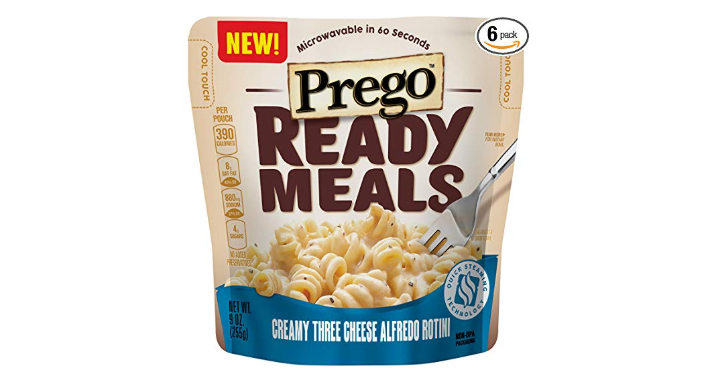 Prego Ready Meals, Creamy Three Cheese Alfredo Rotini, 9 oz (Pack of 6) Only $10.40 Shipped! Amazon has the Prego Ready Meals, Creamy Three Cheese Alfredo Rotini, 9 oz (Pack of 6) for only $10.40 Shipped when you use subscribe and save. If you like those easy go-to meals, then this is the deal for you. Keep in mind, Amazon pricing can change at any time! Don’t wait to purchase this deal or it might be gone when you come back!